Dead Space: Extraction brings last year's chilling shooter to the Wii and sets it on rails. With Resident Evil: Darkside Chronicles and Silent Hill: Shattered Memories both headed to the Wii, can Extraction set itself apart? 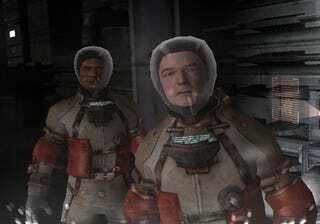 Dead Space: Extraction is a Wii-based prequel to PC, Playstation 3 and Xbox 360 survival horror game Dead Space. The game takes place on a ship of colonists fighting off a strange infection. While the character's path through Extraction is controlled by the game, players can choose different routes. I played through a section of Extraction about a third of the way through the game. How Far Along Is It? The game is about 80 percent finished. Sound of Fury: The audio seemed off a bit when I played the game. Voices didn't exactly match up with people talking and things seemed slightly off during play. I'm sure this is more an issue of an early build than anything else, so I'm not too worried about it. Confusing Display: When you have a developer sitting next to you explaining what the heads-up display means and you still get a bit confused, there's likely a design issue. The game's display needs to be a bit more informative and a bit less confusing. What Should Stay the Same? Controls: The game's controls, from looking around when you're not fighting to firing off shots into swaying appendages, are tight and intuitive. Dead Space: Extraction handles like a shooter should. Thrills: The game does a good job of conveying a sense of foreboding which lays the groundwork for some startling moments. Secondary Fire: Tilting your remote sideways changes the way the gun behaves. It's a neat way to handle alternative firing and adds a subtle level of tactics to the game. Glow: As with many scary games, Dead Space: Extraction has a very dark setting, lots of dark rooms with broken lights. Over the years games have tried all sorts of ways to balance darkness with the need to see when you shoot. I think I like Extraction's method best. To light up a room you have to shake the remote until the side of the screen starts to glow a soft green. As you fight that glow gradually fades, leaving you in darkness until you recharge the light. The effect adds to the sense of panic already present in most fights in the game, but doesn't make lighting your targets a frustration. Dead Space: Extraction appears to be headed down the right path. The developers understand the limitations of the Wii and are doing a solid job of delivering the best experience possible on the console without watering down the general concept. The coming year for the Wii is shaping up to be a pretty exciting one with Resident Evil: Darkside Chronicles, Silent Hill: Shattered Memories and Dead Space: Extraction all working to deliver solid survival horror to a console much in need of the genre.